There are certain programs that you want to execute when your system starts. In general users make a program execute at window startup by copying the executable file to the startup folder. 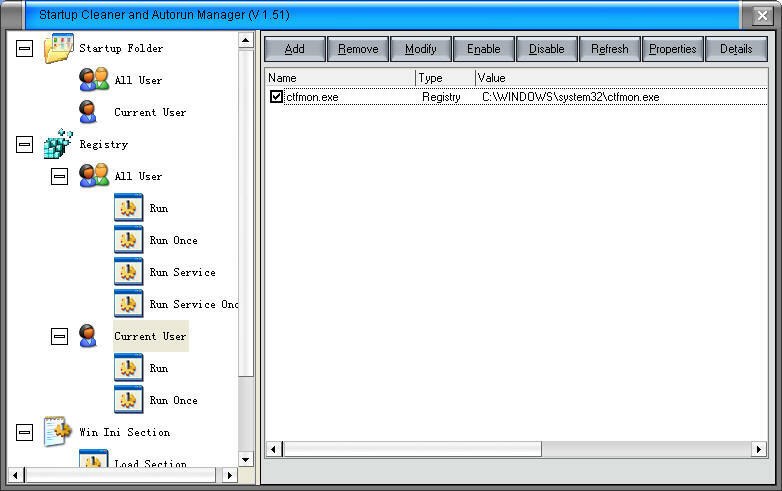 XP Startup Cleaner&Autorun Manager helps you to easily manage program execution at windows startup. XP Startup Cleaner&Autorun Manager is used to administer the programs executing on startup and the files to be loaded at start up. With XP Startup Cleaner&Autorun Manager one can easily add programs which one wish to run once or every time the system starts. Programs added to the startup folder can be easily viewed or removed by any one but XP Startup Cleaner&Autorun Manager provides you tool by which you not only can add programs in the startup folder but also in the Windows Registry and WIN.INI file. Adding programs to the Registry and WIN.INI file protects the program. It has a explorer like interface which displays all the registry folders on the left in a list view. Qweas is providing links to XP Startup Cleaner 3.78 as a courtesy, and makes no representations regarding XP Startup Cleaner or any other applications or any information related thereto. Any questions, complaints or claims regarding this application XP Startup Cleaner 3.78 must be directed to the appropriate software vendor. You may click the publisher link of XP Startup Cleaner on the top of this page to get more details about the vendor.